WHAT EQUIPMENT AM I REQUIRED TO CARRY ON MY BOAT? All watercraft, except sailboards, must be equipped with at least U.S. Coast Guard approved personal watercraft flotation device (type I, II, or III) for each person aboard. Such devices must be in good and serviceable condition, readily accessible, and must fit the person for whom they are intended. All watercraft 16 feet and over must be equipped with at least one U.S. Coast Guard approved personal flotation device (type I, II, or III) for each person aboard and one type IV throwable personal flotation device. When operating a personal watercraft you must be sure that all persons aboard are wearing a personal flotation device. A child twelve years of age or under on board a watercraft must weat a U.S. Coast Guard approved personal flotation device (type I, II, or III) whenever is underway. Any person being towed behind a watercraft must wear a personal flotation device or buoyant belt. Watercraft from 26 to 40 feet long must carry at least two type B-I fire extinguishers or at least one type B-II fire extinguisher. When a fixed fire extinguisher system is installed in the machinery space, there must be on board at least one type B-I approved hand portable fire extinguisher. Watercraft from 40 to 65 feet long must carry at least three B-I fire extinguishers or at least one type B-I plus one type B-II hand portable fire extinguishers. When a fixed fire extinguishing system is installed in the machinery space, there must be on board at least two type B-I approved hand portable fire extinguishers or at least one type B-II approved hand portable fire extinguishers. Watercraft operated during the hours from sunset to sunrise are required to display navigation lights. Inland rules for lights on motorboats under 26 feet prescribe a red and green combination light forward, and a bright white light aft to show all around the horizon (360 degrees). Motorboats 26 to 65 feet must display a 20 - point light on the bow as close as is practical to the stem and a white 32 - point light aft and higher than the bow light to show all around the horizon. Separate side lights showing red 10 points to port and green 10 points to starboard must be used and fitted with screens to prevent them from being seen across the bow. All sailboats without an auxiliary engine on board must display separate red and green lights forward and a white 12 - point light aft. Manually propelled watercraft must carry a lantern or flashlight showing a light which shall be exhibited in sufficient time to avert collision. Lights are not necessary on waters where powercraft are prohibited. All watercraft, when anchored, other than in a special anchorage area must, from sunset to sunrise, carry and display a steady white light visible all around the horizon for a distance of no less than two miles. All inboard gasoline engines must be equipped with a backfire flame arrestor that is approved for marine use and suitably secured to each carburetor air intake. This device is designed to prevent backfire hazard by containing flame and preventing fire or explosion. Flame arrestors must be kept clean to be effective. In lieu of a flame arrestor, open inboard gasoline engines may be fitted with velocity tacks or other similar fixtures. Such devices must be metallic construction, securely fastened to each carburetor air intake, and so designed and installed that any backfire flame will be directed away from the boat and its occupants and dispersed into the open atmosphere. Automotive type air cleaners, with filters of paper or similar construction, are not adequate for marine use and are not permitted. 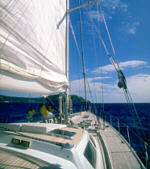 Ventilation is required on all boats which use gasoline as a fuel and have enclosed engine or fuel storage compartments. Regulations require a means of properly and effectively ventilating the bilge areas of engine or fuel storage compartments to remove flammable or explosive gasses. Motorized watercraft operated on state waterways must be equipped with an effective device or devices to prevent excessive noise, unless the watercraft is competing in an approved race or has been issued a race testing permit from the Arizona Game and Fish Department. No watercraft may be operated in a manner that causes it to emit a sound level in excess of 86 decibels on the standard "A" scale when measured from a distance of 50 feet or more. WHAT MUST I DO TO OPERATE MY BOAT SAFETY? A person must not operate a watercraft while allowing any person to ride on the gunwales, the transom, or the decked over bow of a watercraft propelled by machinery operating in excess of a wakeless speed unless that portion of the watercraft was designed and constructed for the purpose of carrying passengers at all speeds or the watercraft is being maneuvered for anchoring, mooring or casting off moorings. A watercraft must not be operated in excess of a posted speed limit or at a speed greater than is reasonable and prudent under the conditions, having regard to the actual and potential hazards existing. Speed must be controlled as necessary to avoid colliding with any person or other watercraft, creating dangerous wake, swamping other watercraft or otherwise endangering the lives or property of others. All watercraft 20 feet or less in length sold or manufactured in Arizona after January 1st,1971, must have a capacity plate attached and readily visible from the position normally occupied by the operator of the watercraft. No watercraft may be loaded beyond the safe carrying capacity indicated on this plate. Such plates are not required on canoes or sailboats. WHAT ABOUT THESE NEW PERSONAL WATERCRAFT (PWC)? A personal watercraft (PWC) is defined as a watercraft that is less than sixteen feet long, propelled by machinery powering a water jet pump and designed to be operated by a person who sits, stands or kneels on rather than sitting or standing inside the watercraft. Some examples of PWC's are Jet Skis, Sea Doos, Wave Runners. A PWC is a Class A boat ands must observe the boating laws just like any other watercraft. Each person on a board a PWC when in operation must wea a U.S. Coast Guard approved wearable personal flotation device. If the PWC is equipped with a lanyard type engine cutoff switch, the lanyard must be attached to the operator's body, clothing, pr personal flotation device. If equipped by the manufacturer, a PWC must not be operated without a functioning spring - loaded throttle mechanism that immediately returns the engine to an idle speed on release of the operator's hand from the control or without any other engine cutoff feature that is installed by the manufacturer. A person must not operate or allow someone else to operate a PWC under his ownership or control in a reckless or negligent manner endangering the life or property of another person. Committing two or more of the following acts simultaneously is considering reckless operation. Operating a PWC within a zone of proximity to another watercraft closer than sixty feet unless both are leaving a flat wake or are traveling at a speed of five nautical miles per hour. Operating a PWC within the vicinity of a motorboat in a manner that obstructs the visibility of either operator. Heads into the wake of a motorboat that is within a zone of proximity closer than sixty feet and causes one - half or more of the length of the PWC to leave the water. Within a zone of proximity to another watercraft closer than sixty feet, maneuvers quickly, turns sharply or swerves, unless the maneuver is necessary to avoid a collision. The operator of a watercraft involved in a collision, accident or casualty of any type, must stop immediately and render reasonable assistance to persons affected. The operator is required to provide his name, address and the identification of his watercraft to any person injured and to the owners of any property damaged. A report of any boating accident must be filed directly with the Arizona Game and Fish Department by the owner or operator of the watercraft. Boating accident forms are provided by the Department, or other investigating officer, and must be filed within 48 hours if death or injury results from the occurrence. In all other cases, a report must be submitted within 5 five days. Report forms are generally available from law enforcement personnel at the lakes, first aid stations, marinas, ranger stations, or from the Department. HOW OLD MUST I BE TO OPERATE A MOTORBOAT OR PWC? Except in case of emergency, no person under the age of twelve years may operate a watercraft propelled by a motor greater than eight horsepower, unless the person's parent or legal guardian or at least one person who is eighteen years of age or older is present on the watercraft. Note: A PWC is greater than eight horsepower. WHAT DO I NEED TO KNOW ABOUT TOWING A WATER - SKIER OR OTHER WATER TOYS? A watercraft having a person or persons in tow on water skis, surfboard, or similar contrivance must be occupied by at least two persons: an operator and an observer. The observer must display a bright or brilliant orange or red flag visible from all directions, no less than 12x12 inches on a side and mounted on a handle, at all times when he skier is down in the water and not actually skiing. Water skiing is prohibited between sunset and sunrise. No person may operate water skis or similar contrivances in a careless or reckless manner so as to endanger life to property, or in manner contrary to that designated by regulatory markers. WHAT DO THOSE BUOYS ON THE LAKE MEAN? They are the Arizona Uniform State Waterway Marking System, and they alert you to danger and give directions and restrictions. It is unlawful to moor or fasten a watercraft to any regulatory marker or remove, obstruct or interfere with any regulatory marker. A diamond means danger. The nature of the danger may be indicated, e.g. rocks, reefs, dams, construction, or snags. A diamond with a cross inside means no boats are allowed. Circles mean caution or controlled area. The nature of the restriction is indicated, e.g. speed limit, no wake, no ski, ski only. A square or rectangular shape indicates information, directions, names of places, or other general information. A can - shaped buoy with alternate red and white vertical stripes means the watercraft should not pass between the buoy and the shore. Mooring buoys are white with a horizontal blue band halfway between the top of the buoy and the waterline. An all red buoy is on the starboard (right) side when going upstream. It may be can - shaped or nun - shaped and may show a white even number. An all black or green buoy is on the port (left) side when going upstream. It will be can - shaped and may show a white odd number. WHAT RULES OF THE ROAD MUST I OBSERVE WHILE BOATING? Normal traffic on waterways is counterclockwise. Watercraft leaving the shoreline must yield the right of way to any craft not under power, unless the unpowered craft is overtaking the powered craft. Operators of watercraft must yield right of way to watercraft entering its "danger zone," which is an area from straight ahead to 112 and one half degrees to starboard (right side) in cases where a collision might occur. Watercraft may pass on either side when overtaking another, but the operator of the passing watercraft is responsible for any collision resulting and for his wake. Watercraft being overtaken must maintain course and speed. Watercraft meeting head - on must pass portside to portside when practical to do so. DO I HAVE TO REGISTER MY BOAT? Every watercraft operated, moored or anchored on the waterways of Arizona must be numbered. The owner must file an application for number with the Arizona Game and Fish Department on forms provided. The number issued must be displayed on each side of the bow along with the current registration decal issued by the Department. Registration is staggered, similar to motor vehicle registration. Decals issued will be the color of the year of expiration. If ownership of a watercraft changes, the new owner must notify the Department within 15 days if his address changes or if a watercraft is stolen. No number other than the one issued by the Department may be displayed on the forward half of any watercraft. The registration certificate must be aboard when a watercraft is in use. If a certificate of number is lost or destroyed, a duplicate may be obtained from the Department for $2.00. 45 cents per foot up to and including 18 feet, and 68 cents per foot beyond 18 feet. Non - residents will be charged $1.45 per foot up to and including 18 feet, and $2.75 per foot over 18 feet.